Who thought he lived in a palace. At banishing signs of malice. This entry was posted in Dogs and tagged limerick, sleeping dog. Bookmark the permalink. This is brilliant! And what a charming picture of Dallas, with his little pink tongue peeking out. No doubt your house is a palace, Debbie! Thanks, Lucy. Dallas, for sure, thinks it’s *his* palace! He is a Prince, after all! You know, I think he’s aware of that! Probably not unlike the majestic Terry, no?? Oh Terry believes he is the king of the universe. He probably is. Cats always assume that! Dogs have to be taught. OMG Debbie….this put a huge smile on my heart :) Your limerick is so clever! And the picture of Dallas (the cutest dog in the whole wide world – in my opinion) is so precious. What a kissable, huggable, and lovable doggie! Thanks for the smile this morning, my friend! I’m glad you enjoyed it, Ron. 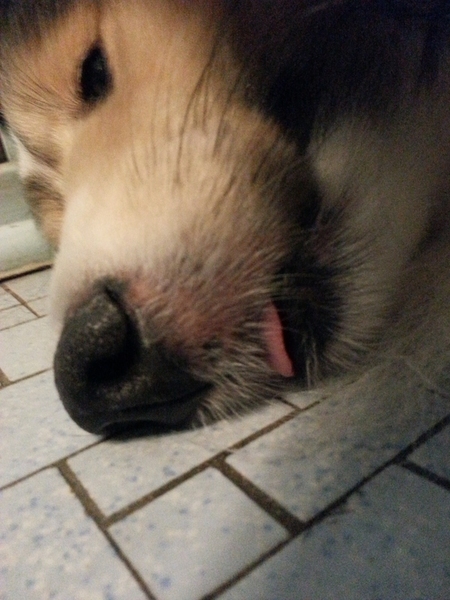 I’m still amazed I was able to catch Dallas snoozing with his tongue out! Usually, he seems to have a sixth sense when it comes to my camera and refuses to play along for the shot. I know you’ll have FUN in NYC — and I’m hoping we’ll hear about it on your blog, complete with photos. I hope the weather cooperates and the rains hold off for you! Isn’t he a cutie! That little tongue is the perfect focal point, and your limerick’s great. They are so sweet when they’re asleep, aren’t they? Now, if only I could convince Dixie Rose to sleep through the night, instead of wanting to turn her palace into a playhouse at 3 a.m.
Aw, thanks, Linda. You know, there’s something vulnerable about a sleeping pet of any type. They’re just so trusting that nobody will step on them, frighten them with loud noises, tickle them, or anything annoying. I’m fortunate Dallas doesn’t think 3 a.m. is play-time! And now that morning light is coming later and later, he’s reluctant to stir until 6 or so. Probably the “old dog” within him, but I’m not complaining. It buys me a bit of extra time, too! Good one Debbie. No malice in your house. Thank you, John. One of many lovely things about puppers — they don’t hold grudges! Thanks, FF — glad you enjoyed it! I suspect dear Tuppence and Tommy enjoy their fair share of eating, sleeping, and playing, don’t they?! Dallas has the life! Sigh. Gee, when a Poetess says she likes something you’ve written, you know you’ve succeeded — thank you, Miss A.
Don’t you love watching them snooze?? Awe, Dallas. He’s such a cutie! Thanks, Lana — he does cute things! Eat, sleep, play, potty. Repeat. Pretty good gig!! I remember when we had to write a limerick in English in school…that was about 50 years ago. Your post today bought it all back. Thanks for the memories! Hope they were GOOD memories, Tanya!! ‘He ate and he slept’ oh how I envy him! I really enjoyed the limerick, and I love the picture! Thank you so much — and welcome to my blog. I’m off to read some of your posts as well. Nice to see a new face around here every so often!